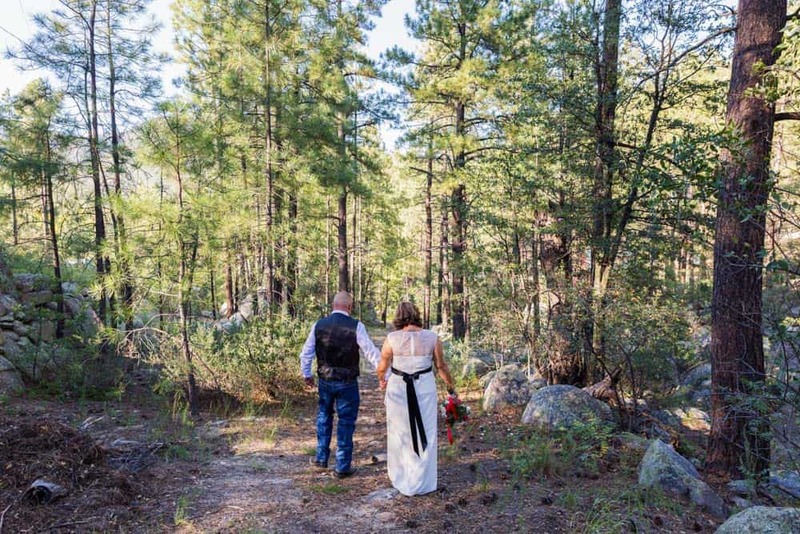 Come to the Crown King Cabins, Suites and Bunkhouse, nestled in the majestic pines, and create and celebrate your unique, special wedding day with lasting memories of a lifetime. 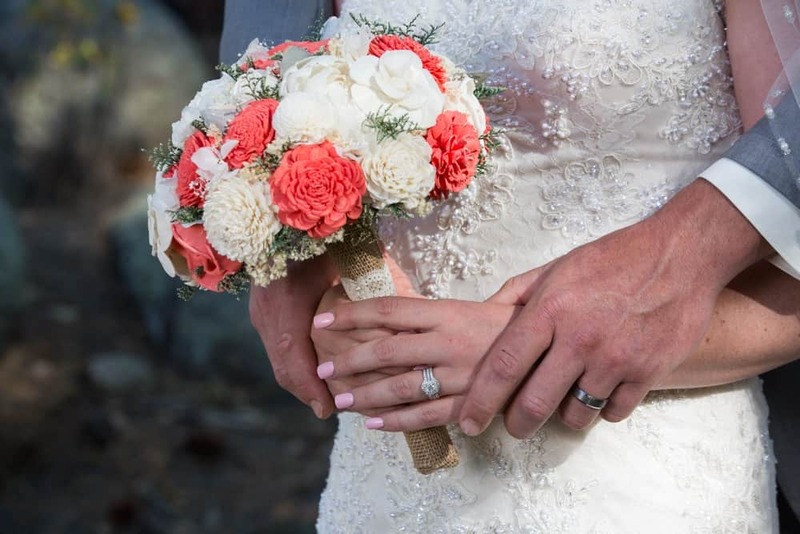 As your wedding planner, we will “do-it-all” for you and yours. 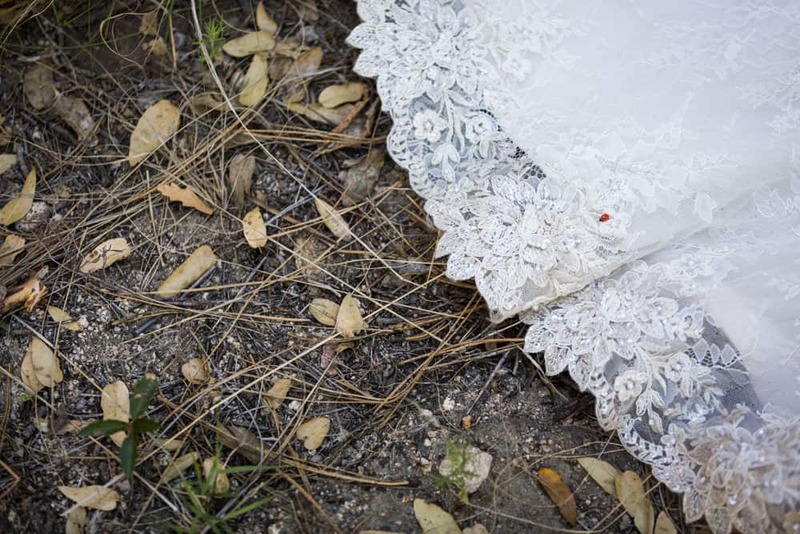 Beginning with our unique, rustic atmosphere for your very special day…an out-of-doors wedding in the pines with a touch of the “old” west… Join hands and hearts as you enter into matrimony and become husband and wife on a piece of land in the beautiful Southern Bradshaw Mountains, amongst the majestic pine trees, while in the background, the song of birds and nature. The Crown King Event Center can accommodate 200+ people for the Reception. Have your reception in the courtyard or you may prefer the all new Crown King Event Center. This park-like setting in the pines features 2500 sq. feet of sod, and outdoor lighted stage, a covered beverage and food area as well as the amazing Pine Tree backdrop. An experienced personal chef will prepare a great meal for you and your guests, choosing from our wedding menu and serving beverages. Two-step or Waltz the night away on the dance floor, the stage is just right for a Disc Jockey or a band. Spend your wedding night in the “Ranch House” cabin, The Orabelle, or the “Cottage by the Creek” as our wedding gift to you. 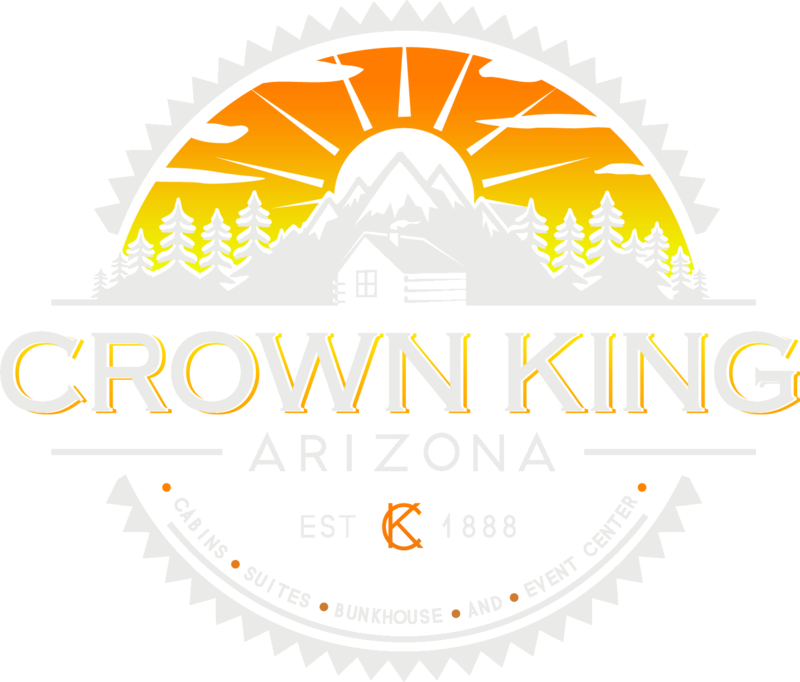 Schedule your rehearsal dinner or Bachelor/Bachelorette Parties at the Crown King Bunkhouse or I can arrange a special meal catered for you by one of our fine dining facilities. 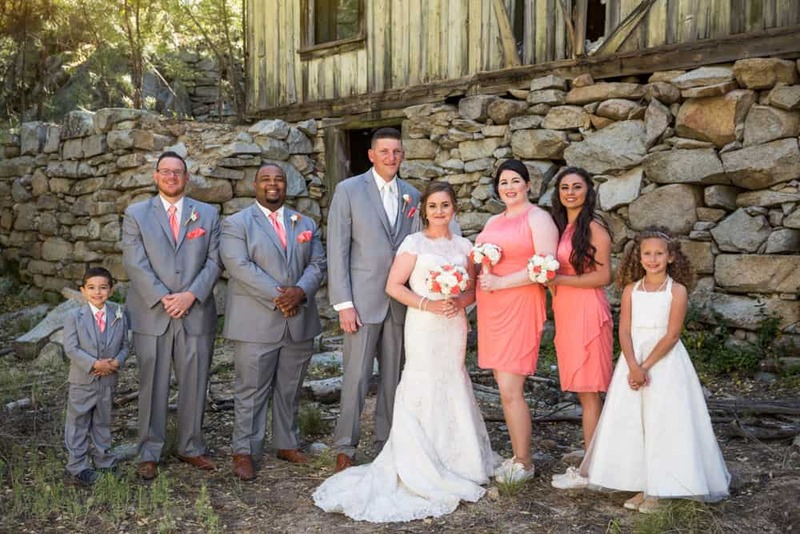 Whatever you have imagined for your very special day, the Crown King Cabins, Suites, and Bunkhouse ( formerly Bradshaw Mountain Guest Ranch) can make your dreams come true. Make a date to visit and tour the Property and see what we have to offer. 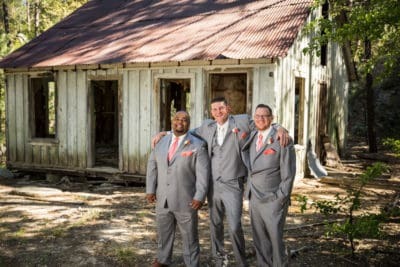 Available dates go quickly, so please, reserve your special day soon. 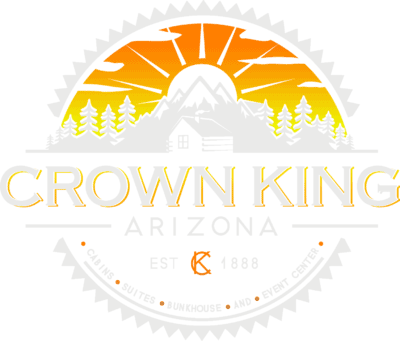 Call (928) 632-4477 or e-mail Taryn at crownkingaz22@gmail.com. Because every wedding is unique and special in its own way, it is difficult to put a set price on weddings. 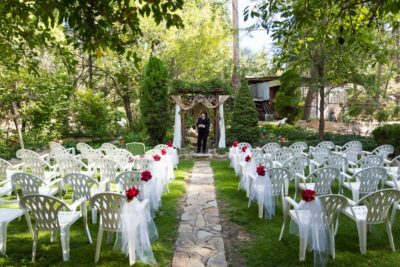 The bare minimum fee for the Courtyard, Garden, or Church setting is $500 and includes the Minister. This year 2019 we are featuring 2 new Elopement Packages, call Taryn for the details and pricing. The Crown King Cabins, Suites, and Bunkhouse can accommodate lodging for 50 people. If extra lodging is needed I can make arrangements with the other lodging facilities in town. 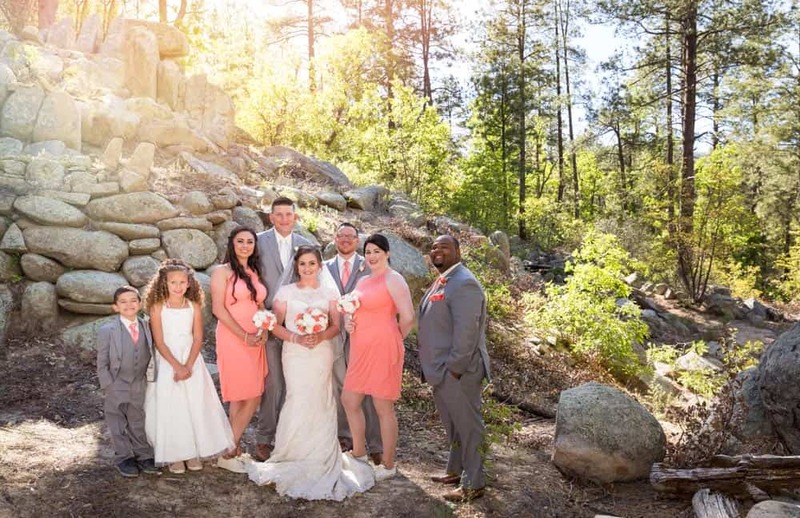 Ask Taryn about the ‘Special Pricing’ package that includes the Wedding Ceremony, Lodging, Personal Chef Wedding Meal and Reception for 50 guests. 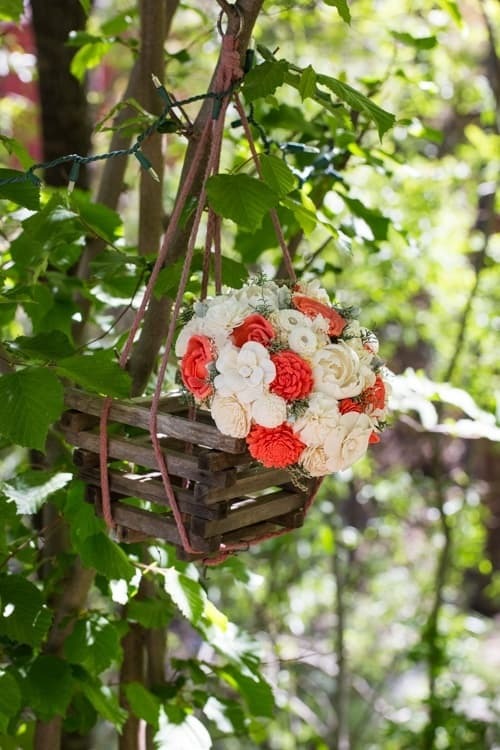 Better yet your guests will help pay for your special day so you can concentrate on the special dress, flowers, and decorations. 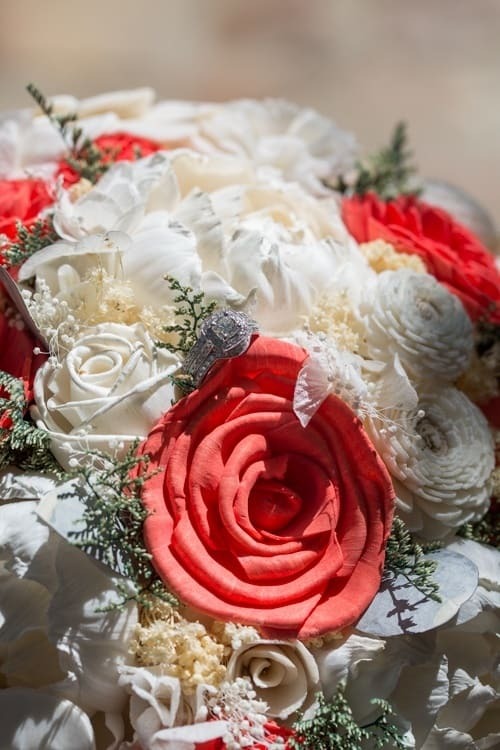 · The cost of the Minister is $500.00 and the actual wedding ceremony varies, depending upon the number of guests and preferences. 3. We have bands to hire with a price range of $600.00- $1200.00, or you can hire a Disc Jockey if you prefer. 4. 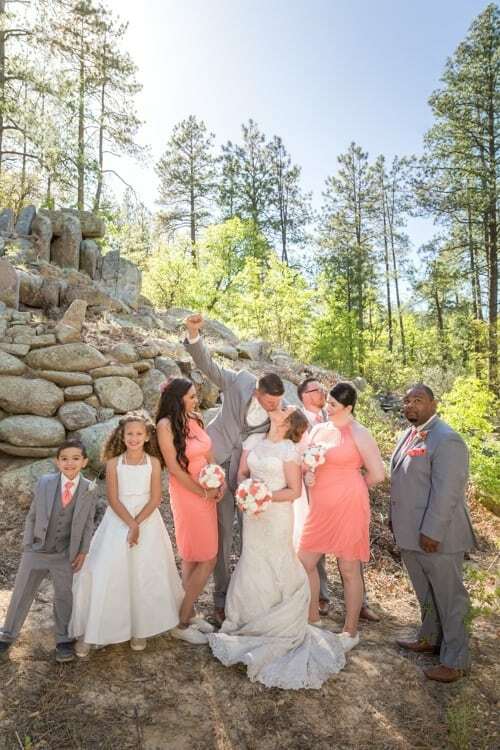 A photographer for before, during, and after the ceremony and reception is also an option you can request. 5. Personal make-up artist and hair stylist available upon request. 6. 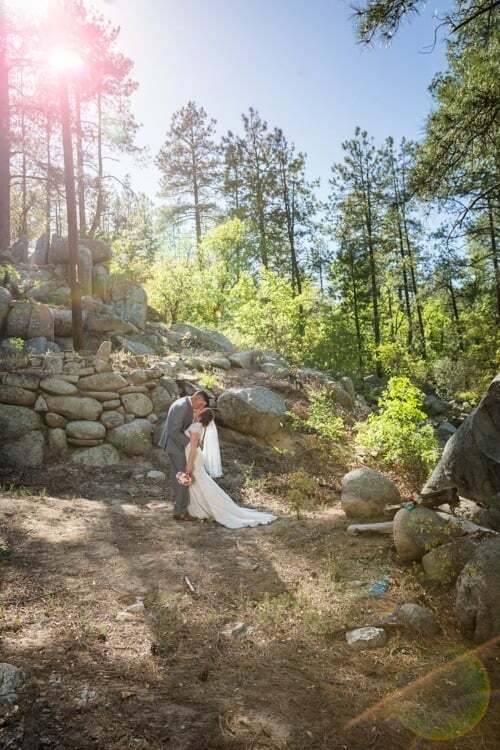 The best time of the year for weddings in Crown King is from May until October. The weather can be unpredictable from November thru March( Church setting is best, warm and cozy), but definitely do-able and specials apply. 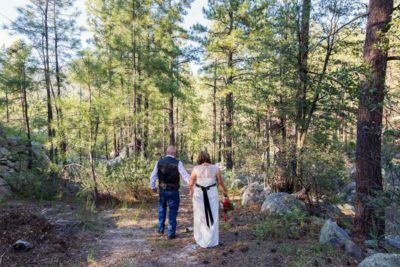 Take a day trip and visit Crown King Cabins, Suites and Bunkhouse, so you can tour our facilities and the optional setting choices. 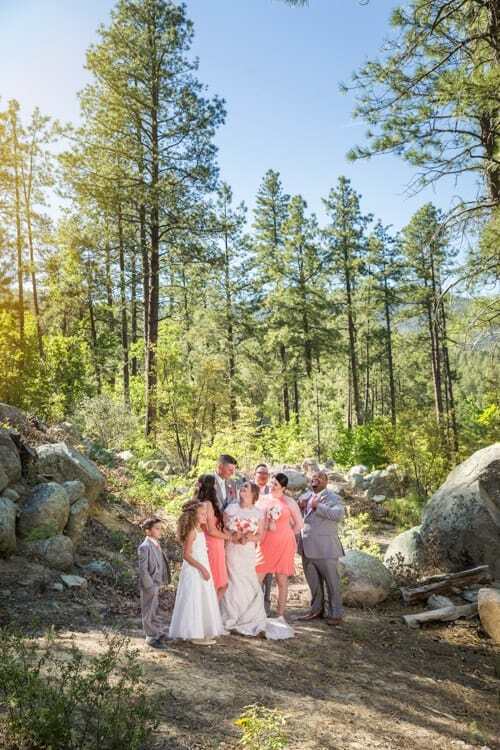 The natural scenery around the Crown King Event Center is beautiful with nothing but tall pine trees, surrounded by lofty mountains and vibrant green grassy areas and gardens. Each Season brings a host of different flowers in Taryn’s gardens. Crown King sits in a basin at 6000 feet above sea level. There is no commercialized development around the property. We offer quaint, peaceful, clean rustic surroundings. We also offer overnight accommodations: 4 cabins and 5 suites, fully equipped with kitchens, temperature controlled, private decks and entrances, lush gardens and courtyards, and quiet enjoyment. U.S. Forest Service camp sites are located just outside of town. 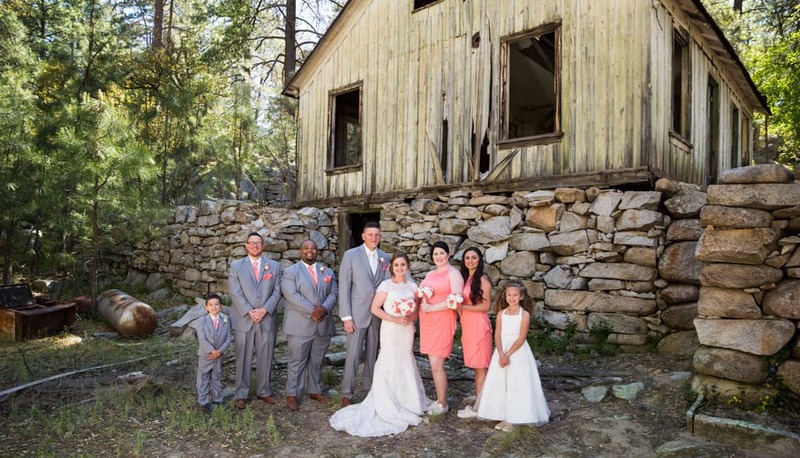 We also offer lodging for larger groups at the Historic Crown King Bunkhouse. This home has been updated and modified but still has the historic charm with pictures and antiques.